Thursday, February 28, 2013 through Sunday March 31, 2013-Las Vegas, Nevada (part two): Before reporting on the continuing adventures of Bill and Kit in Vegas I would like to profile our other great kids and grandkids that live back in Maine. Since we only journal our annual Excellent Adventures and never report on our doings for the remaining seven months of the year, our Maine family (no pun intended…..or implied) rarely gets mentioned. The following is an attempt to rectify that inadvertent slight. 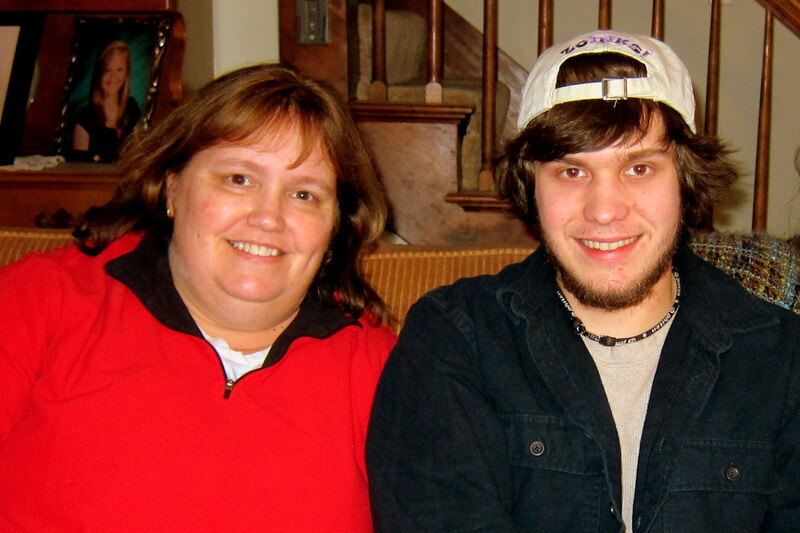 First off our oldest, Kim and her son Joe. 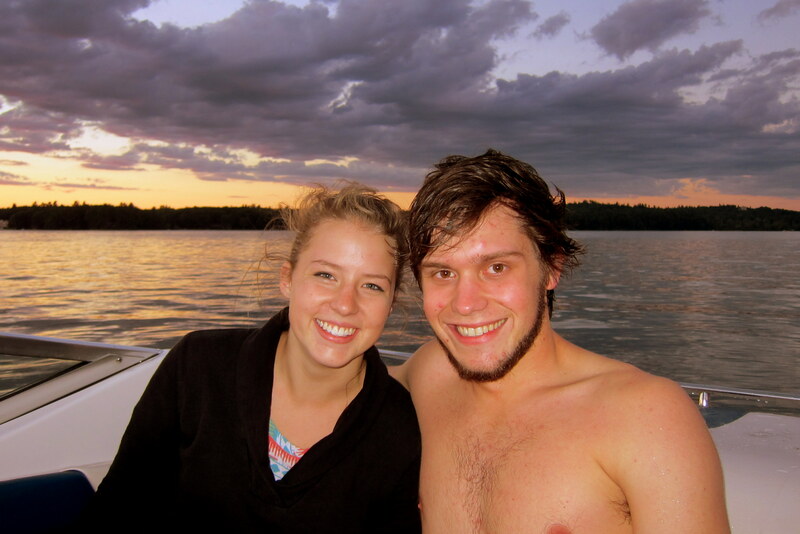 Joe, a college junior is seeing a delightful young lady by the name of Abby who is a freshman at the same university. They have been inseparable and Abby is already like a member of our family. 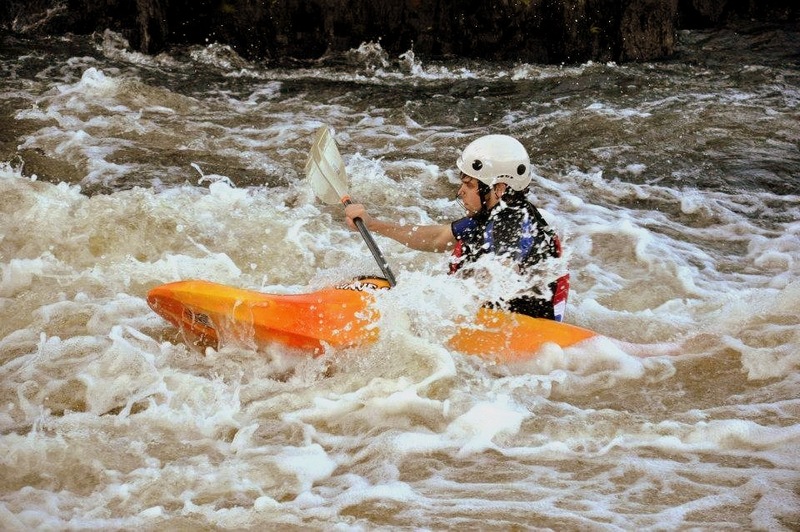 In addition to hanging out with Abby, Joe enjoys playing hockey, rock and ice climbing, downhill skiing and white water kayaking. 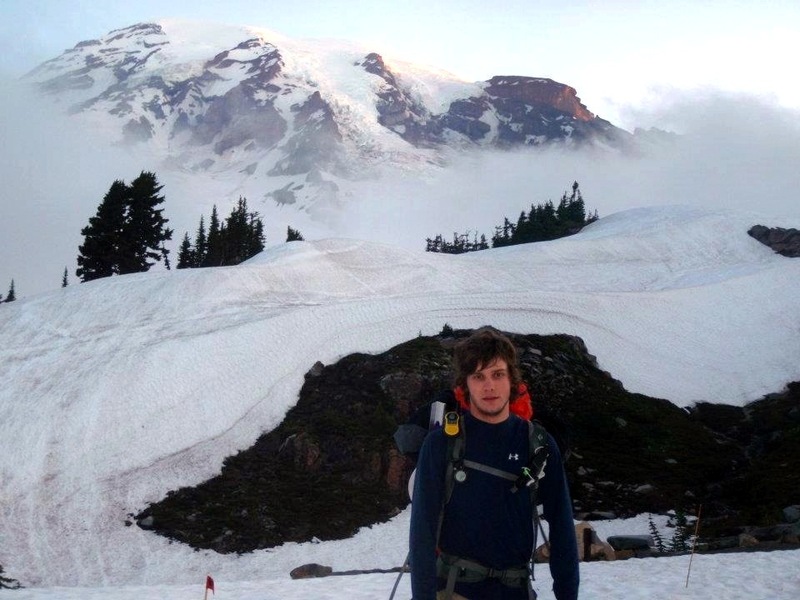 He is also an accomplished mountaineer…..last July he and a team of three other Maine folks mounted a summit attempt on Mount Rainer in Washington state. 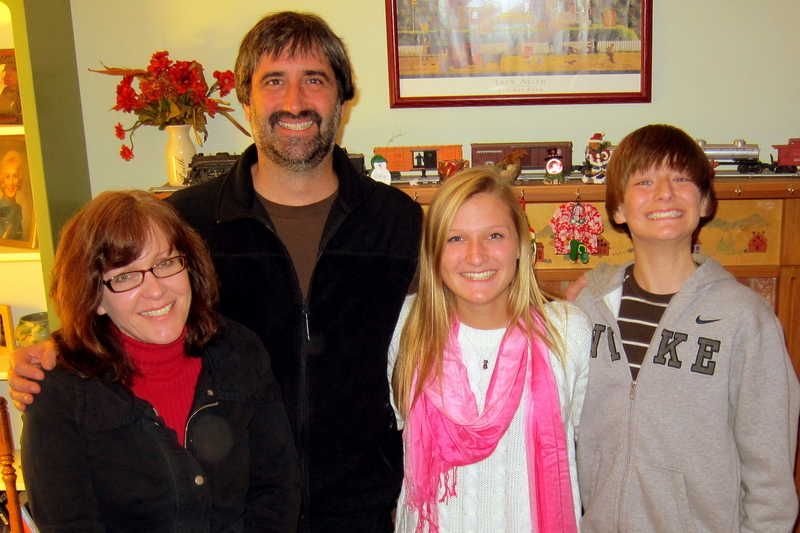 Also back home in Maine reside our son Joe and his wife Ann, along with our two middle grandchildren, Katie and CJ. Joe, an IT Security Specialist is into snowmobiling and motorcycling when not working on building the family home nestled in the woods of western Maine. 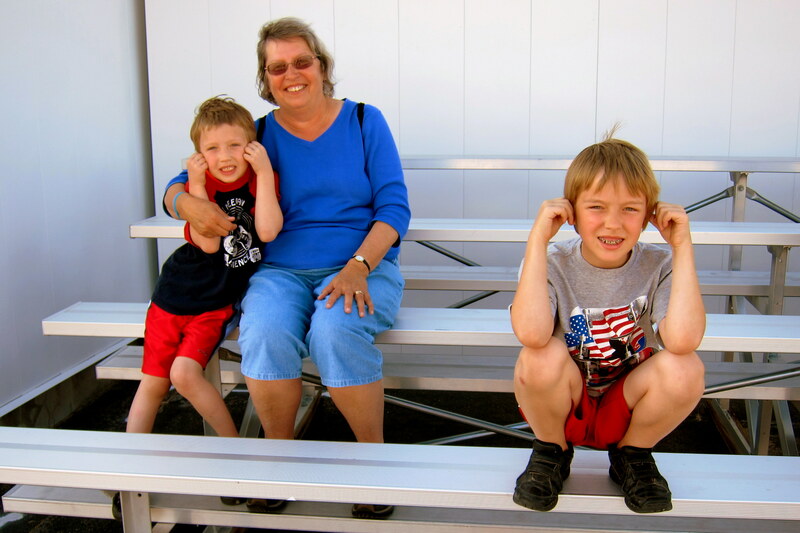 Ann works for a local nonprofit and keeps everyone in the Tucker home on schedule and in line. Katie is a high school junior and is seeing a nice young man by the name of Jimmy. Katie is an avid snowmobiler, skier and varsity athlete on her schools soccer and lacrosse teams. Last December she was selected to an all-state lacrosse team to represent Maine at the Presidents Cup in Florida where they won it all! As a result she is already getting inquiries from various colleges. Katie is also an animal lover and especially likes the very tasty variety. 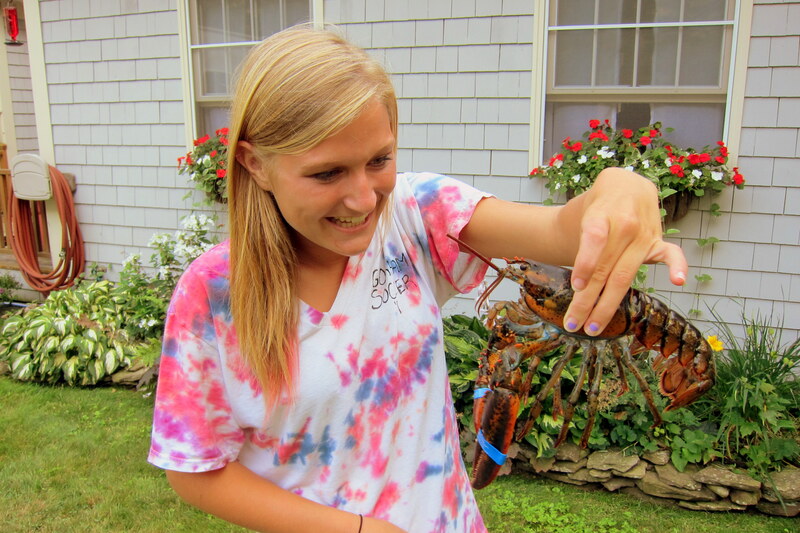 Actually she is a vegetarian and rescued this little fellow last summer during our annual lobster boil and barbeque. 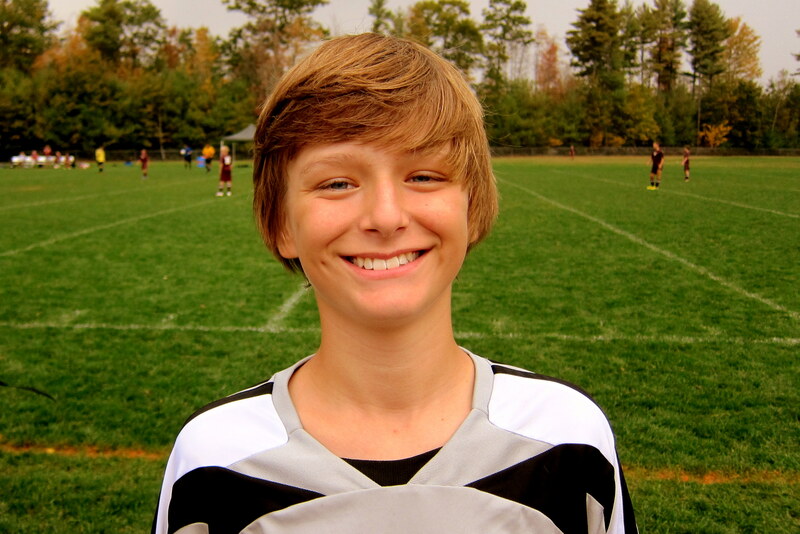 CJ is in the 7th grade and also snowmobiles, ski’s and plays soccer and lacrosse. In addition he is quite accomplished at the game of basketball. 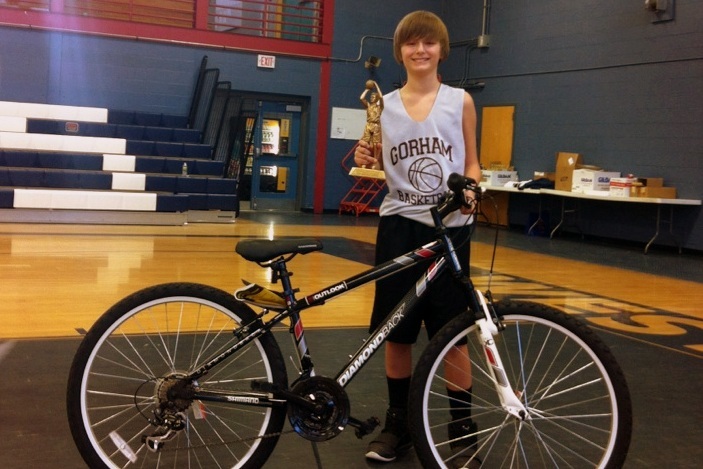 Last year, he won the annual town free-throw contest and eventually went on to the win the Maine state event where he received a trophy and was awarded a brand new bicycle. 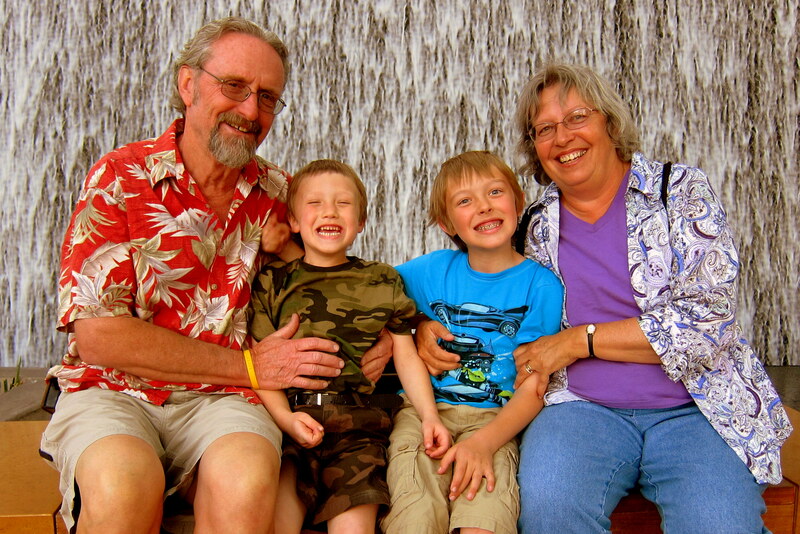 Well, that about rounds out the doings of our five grandchildren, great kids all…..and their folks are OK as well! The final two weeks in Vegas were as much fun and as busy as the first two. On our travels over the past five years, we rarely stay in any one place for very long. 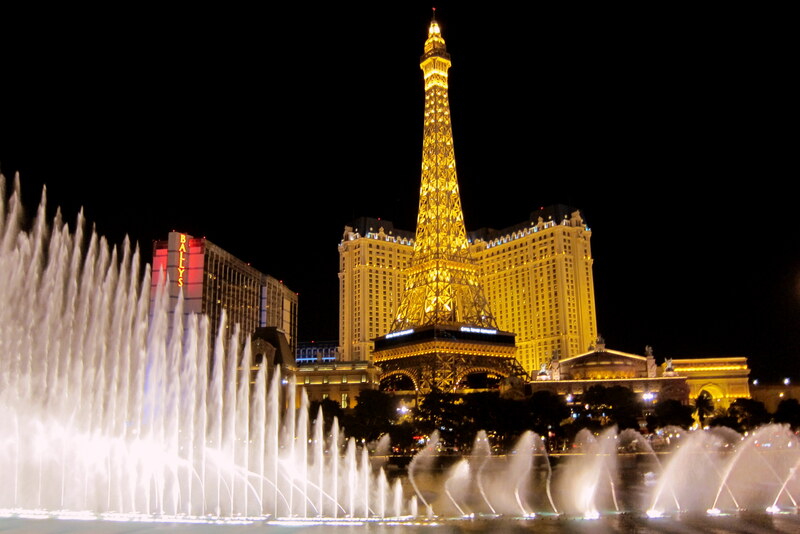 Las Vegas is the exception…..we usually drop anchor for a month or so to enjoy time with our Vegas kids. As before, we continued to have Jack and Tucker out at the campsite for the weekends. Generally all they needed to entertain themselves was a couple of grocery bags, a few sticks and plenty of dirt. However we did take them on a couple of outings. One of which was to the local Natural History Museum where they were able to learn about the history of the Las Vegas valley before Frank Sinatra arrived. 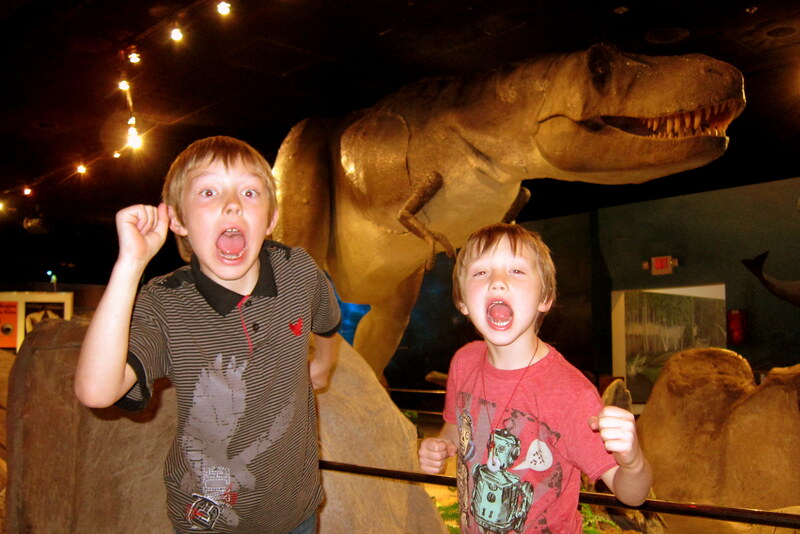 Dinosaurs being a particular fascination of the boy’s, they had a great time in the interactive dino exhibit. 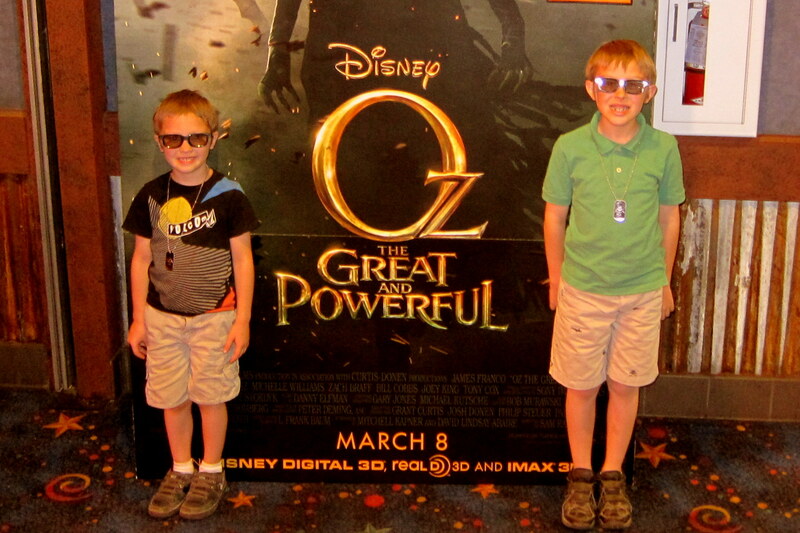 On a particularly hot day we took them to see the new Disney movie “OZ, The Great and Powerful”, which was playing in 3D. A prequel to the famous movie “The Wizard of Oz”, it was a fantastic production and held particular significance to those of us who remember seeing the original. In addition, the modern 3D effects were far superior to the ones when we were kids. We highly recommend seeing this film…..with or without youngsters! 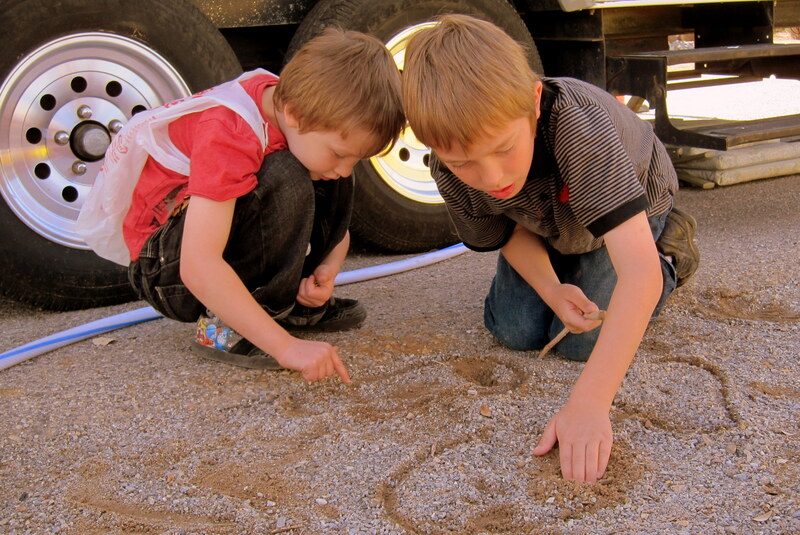 As I’ve mentioned previously, both boys are very creative and when left to their own devices will come up with unique and creative ways of play. Here is a video of their latest invention, Ice Cube Basketball. 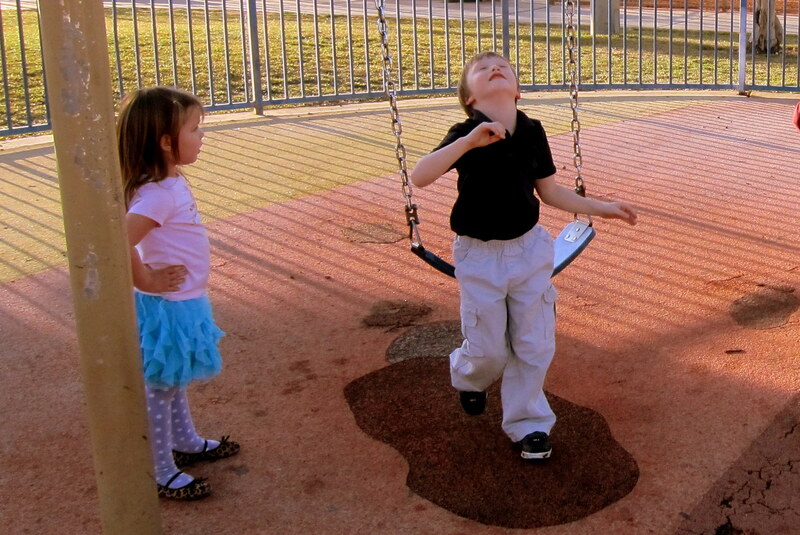 One afternoon, while watching and photographing Jack and Tucker at a local playground I was close enough to hear this exchange. Women…..you can’t live with them and you can’t live with them! Speaking of women, while driving about town we pulled up to this sight at a stoplight. 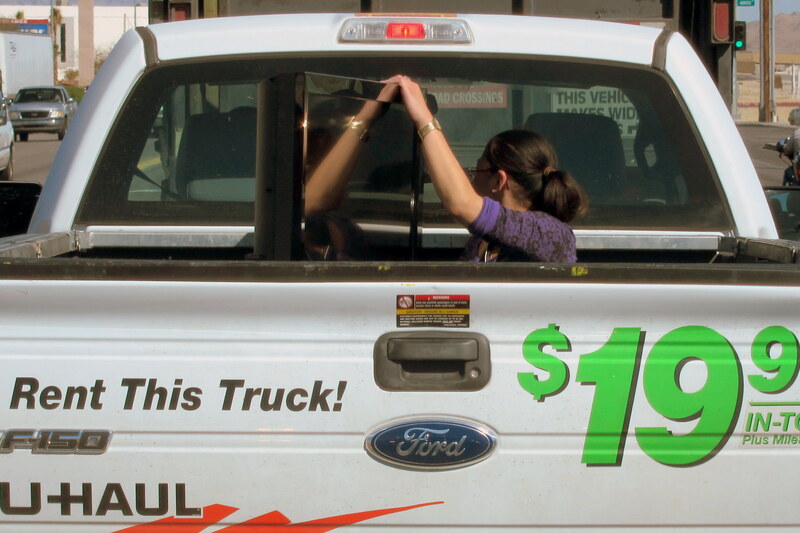 Gotta be a girlfriend…..no way a wife is gonna sit in the back of a rental truck to stabilize a recently acquired flat screen TV. During a session of Retail Therapy at “The Wall Mart”, Kit, a lover of fine art, found this masterpiece that is currently occupying a place of honor in our camper. Who sez we ain’t cultured? Las Vegas was pretty warm during our stay, however it was generally not warm enough to warrant turning on the air conditioner. It was however a great opportunity to check out the effectiveness of a modification I had made to our camper before leaving Maine. I had suspended a couple of 4 inch fans above the bed that provide a gentle breeze at night In addition, the rhythmic whirring of the motor created a soothing sound that blocked out any ambient noise that might come through the open windows. The last week of our stay, Kevin’s brother “Uncle Steve” came for a visit from Missouri. We purposely waited to visit the new Discovery Children’s Museum so the Uncle Steve could join us. 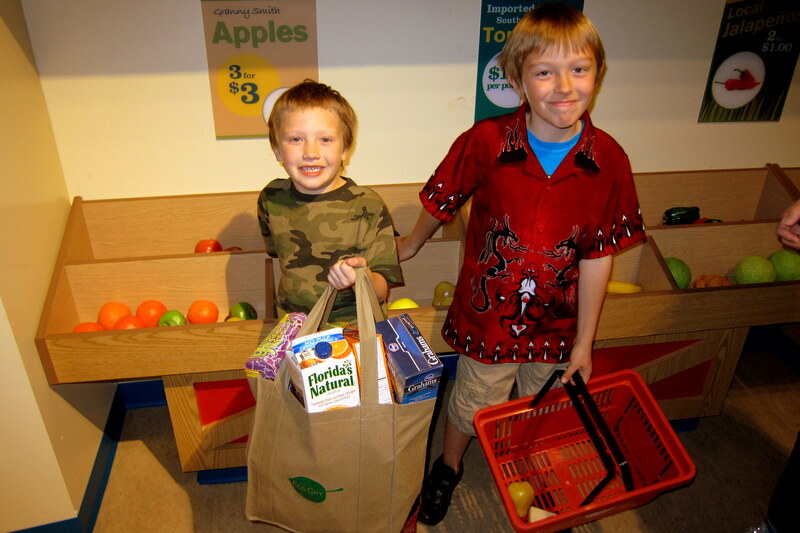 The museum is a fully interactive facility geared for the education and enjoyment of children of all ages. They can dress in costumes and put on plays in the mini theater. 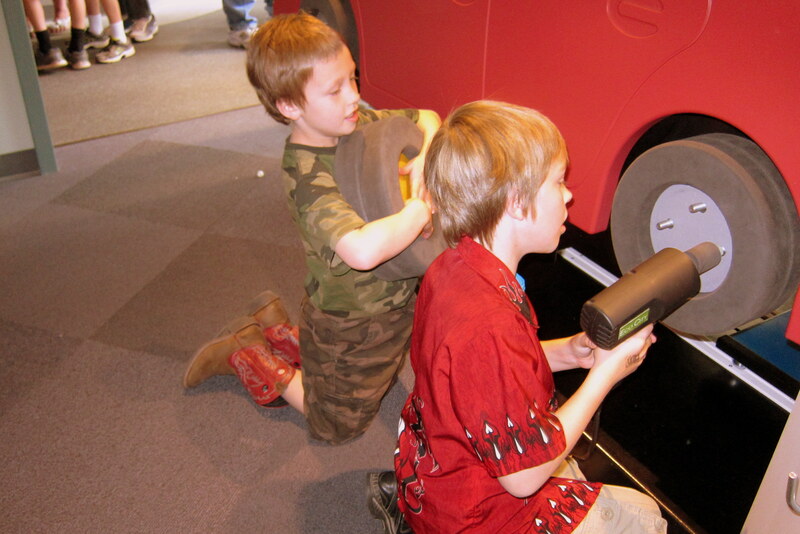 Also, children can pretend they are auto mechanics. Or that they are shopping for the family groceries. Note the take of the two brothers…..another sign of their individual personalities. 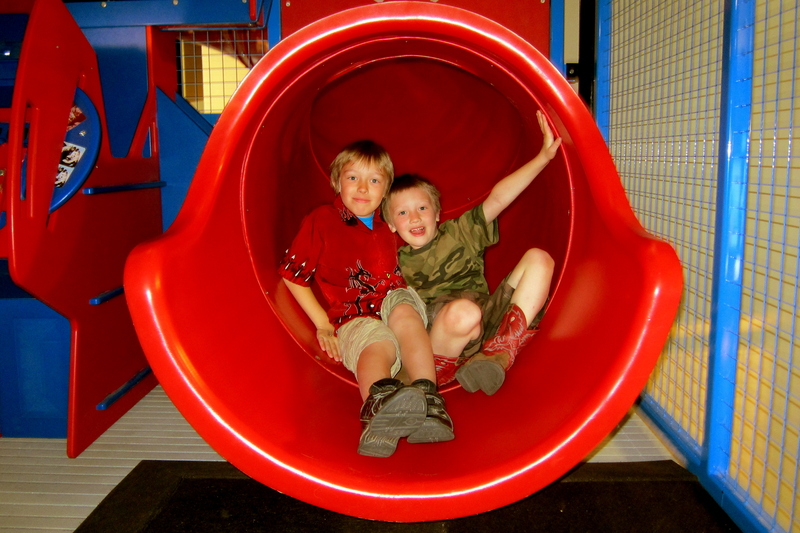 There was a three story tower that kids could climb with concerned parents in hot pursuit…..only to realize that the kids had an express route back to the main floor. This feature allowed for some pretty funny running up and down by folks trying to figure out where their kids were. Steve, Kit and I developed a system where each one of us would station ourselves on a level and report via text the sightings of Jack and Tucker…..worked pretty well and the kids could bounce about where they may. 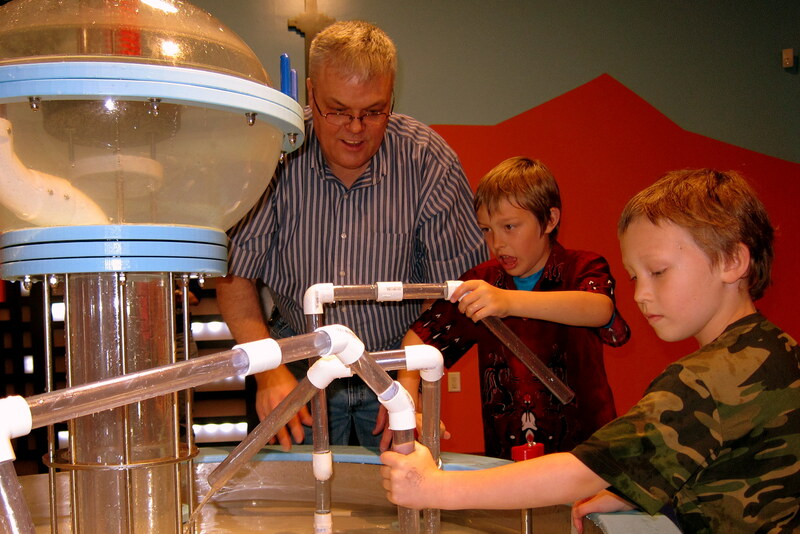 In another room visitors can design a plumbing system to deliver water to various parts of the facility. Everyone that dared to enter this room was drenched to the bone; however no one seemed to mind! 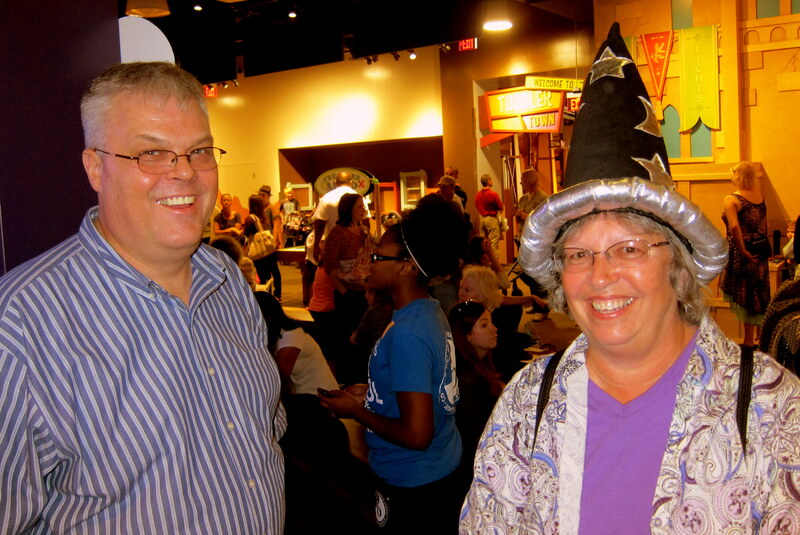 A great time was had by all….The Children’s Discovery Museum is a definite candidate for a return visit! Kit and I would fill the weekdays with shopping, errands and just lazing about camp. On one occasion we were out in western Vegas poking around and decided to stop at a local restaurant for a meal. As we pulled in a truck fitted for trailer towing pulled in near us and a conversation ensued about traveling about in RV’s. 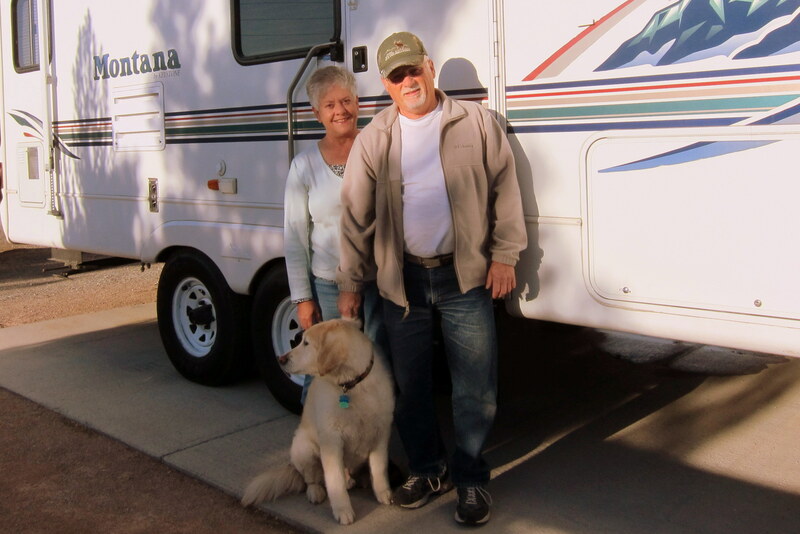 As it turns out Karen and Rick are sunbirds…..retirees that live in the south and escape the heat of summer by heading in their RV to cooler climes. We invited them to join us at a table and had a great conversation about our backgrounds, lives, kids and retirement experiences. Rick is a car nut as well and has a 55 Chevy that he has street rodded and takes to cruise-in’s around the Las Vegas valley. We invited them to haul their trailer to Maine for a summer visit…..hope they take us up on the offer! 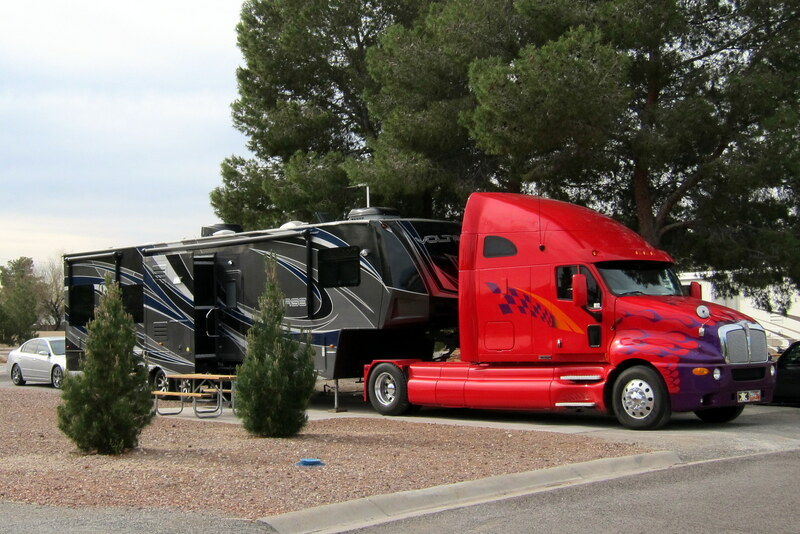 Walking around the campground at Nellis, one is struck by the diversity of rigs that folks select. 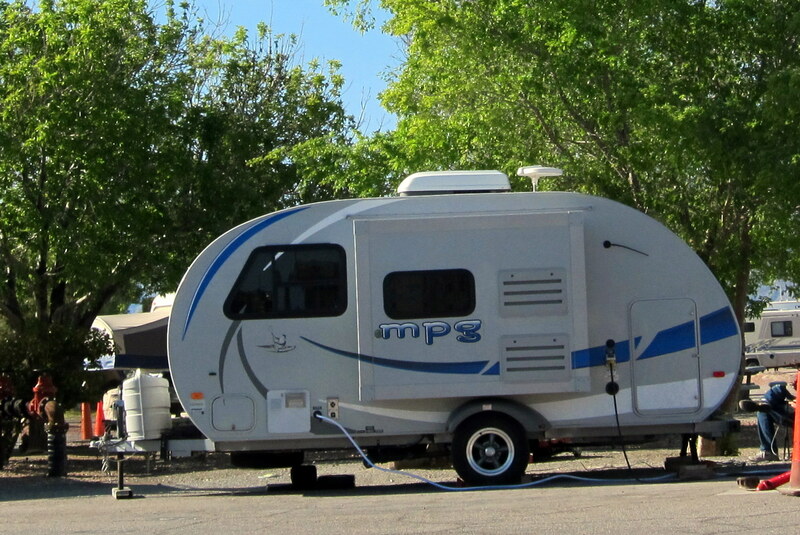 There are monster RV’s that include a garage. The one above actually houses a Mini Cooper in a ramp accessible space to the rear. When the car is backed out, the garage and ramp turn into a patio complete with railings and patio furniture! There were even trailers that are actually smaller than ours! The one above is a winter getaway home for a very accommodating retired couple from Washington state! They did seem to spend a lot of time sitting outside, however. The folks that we met during our stay were as diverse as their rigs. There was Tyrone, a newly retired Navy Seal that was traveling about the US before embarking on his next career. There was a fella that started a wiki site that profiles historic forts (www.fortwiki.com). There was a retired Navy musician and Las Vegas performer that knew some of the same entertainment people that Suzie did. There was the former USAF F-111 pilot that discovered that his camp neighbor was a Vietnam Army Vet who had radioed the pilot’s jet into a target area some 40 years ago, and possibly saved his hide. There was the 75 year old man that retired with 30 years of service as a Navy Seal in Vietnam…..a legend in the Seal community according to Tyrone. There was a family from upstate New York that had turned to farming after retiring from the military and was on a dream trip around the US with their 5 children. Each and every one of these campers had an interesting story to tell…..wish I had the time to thoroughly document them all! 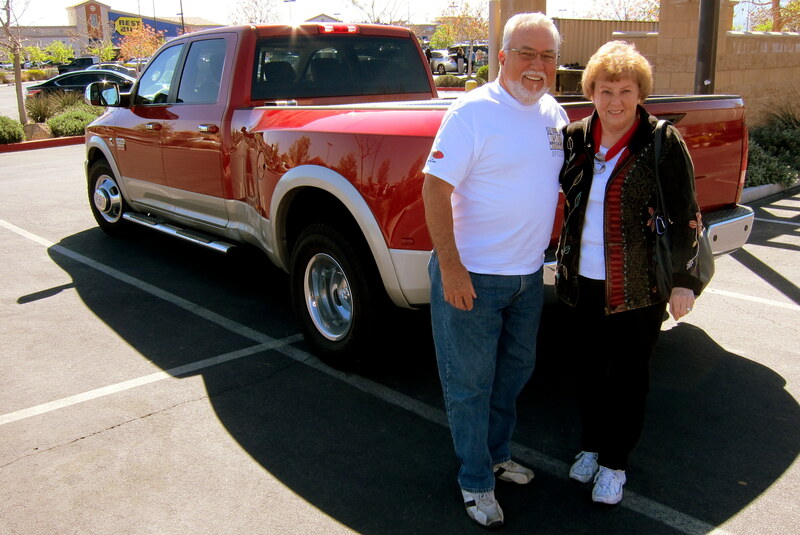 We also had some great neighbors during our stay, Tom and Sharon from Idaho were parked right next door. Tom is a retired music teacher and band director had picked up a couple of fun gigs while in Las Vegas. We had a great time getting acquainted and invited them to visit us in Maine during their next RV trip to the northeast. As you may know, I have an obsession with bicycles…..don’t ask how many I currently have, its kinda embarrassing. I especially like to acquire what I call “Rescue Bikes” or bikes that folks possess but don’t really want anymore. Over the years I’ve picked up a number of rescue bikes and after a thorough cleaning, some repair and a tune up returned them to their former glory. 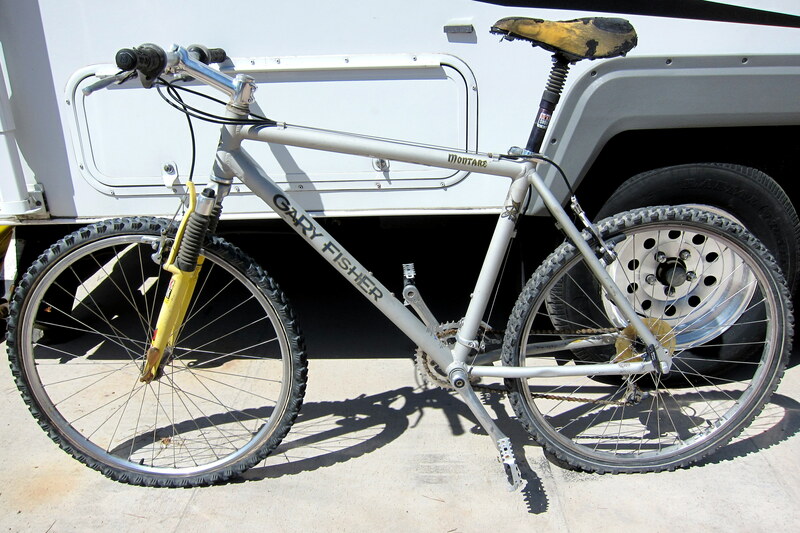 Well, on this trip I was able to rescue a vintage Gary Fisher Mountain Bike from Suzie and Kevin’s backyard. Thanks again guys…..this baby is now strapped to the camper’s rear ladder and is heading to my shop in Maine. Before we leave this subject an appeal of sorts…..if anyone has a vintage bike, say one that is hanging upside down from the rafters and seems to always be in the way…..I can give it a good home! 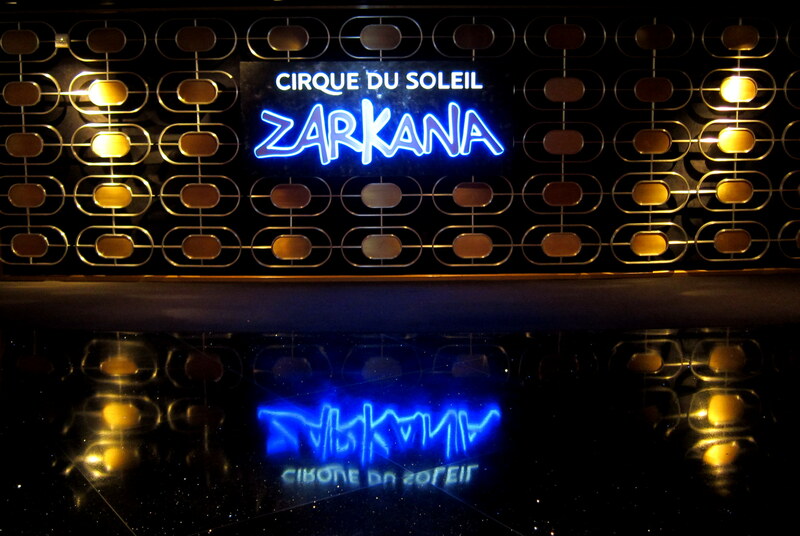 Speaking of our Vegas family, Kevin is the sound manager for Cirque du Soleil and was able to hook us all up with tickets to his show “Zarkana”. 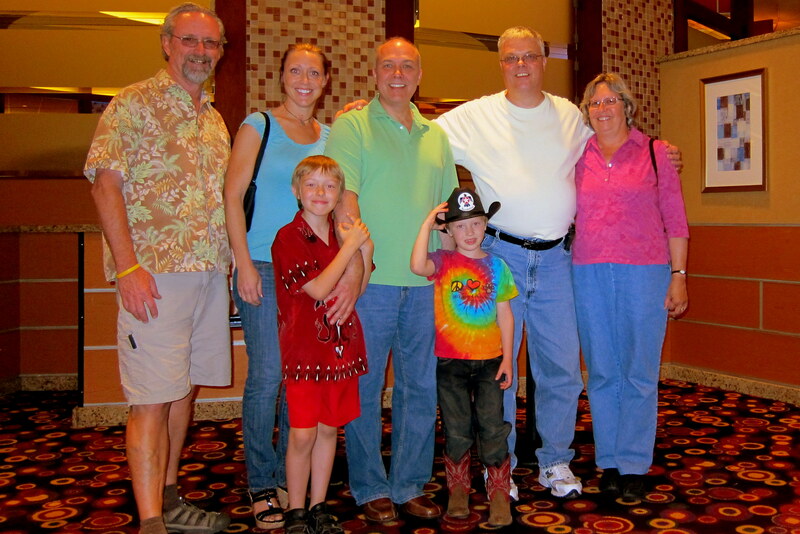 It was a wonderful show…..Kit and I, Uncle Steve and the boy’s thoroughly enjoyed the performance. After the show let out we all took the monorail down the Las Vegas strip. Where we enjoyed a few different performances of the water-show at the Bellagio. The music and spectacle was well worth seeing, and the price was right! 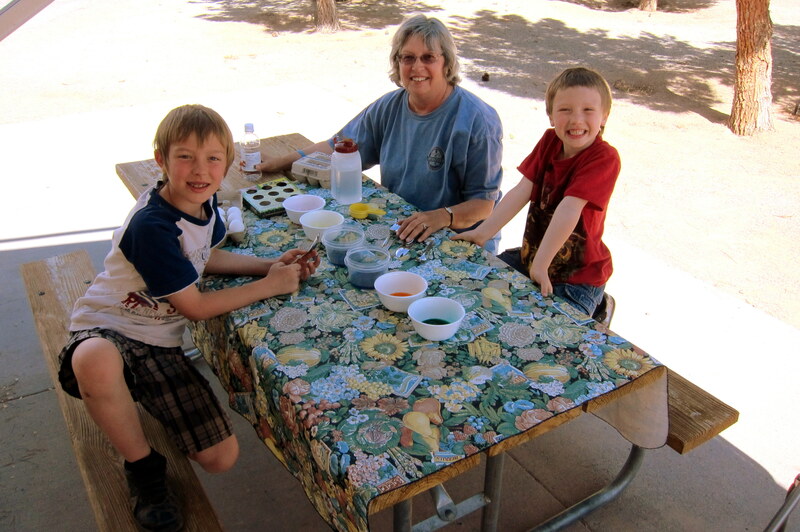 As it turned out, the boys were with us over Easter Sunday so in preparation Kit hard boiled some eggs and everyone participated in making Easter masterpieces. Somehow, the Easter Bunny knew Jack and Tucker were with us and came under cover of darkness to hide all 18 Easter Eggs within the confines of a darkened 176 square foot camper without stubbing his or her toes too much. In the morning the boys were delighted to find Easter gifts as well as searching for the hidden eggs…..hope they found them all!?!? 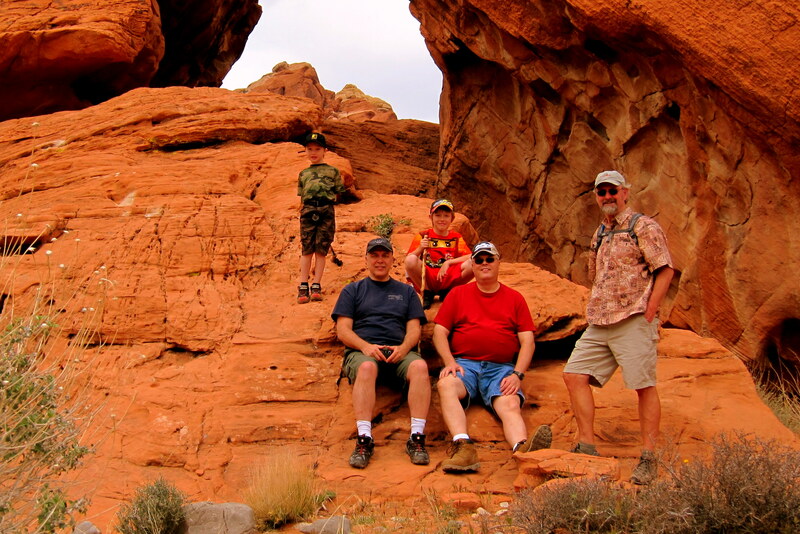 One of Uncle Steve’s favorite things to do during his annual trip to Las Vegas is to take the boys hiking at Red Rock Canyon, and he graciously invited Kevin and I along. 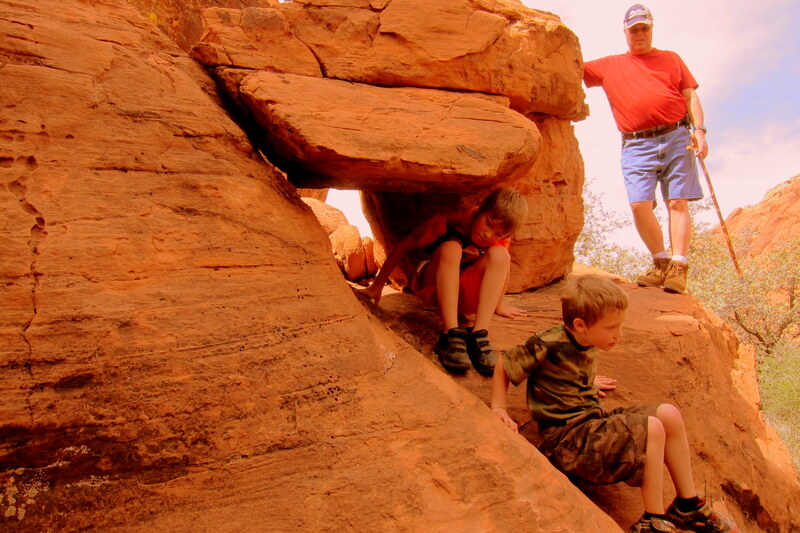 And finding natural caves and holes within the canyon walls to explore. While we were hiking there were a number of bumblebees flitting about. 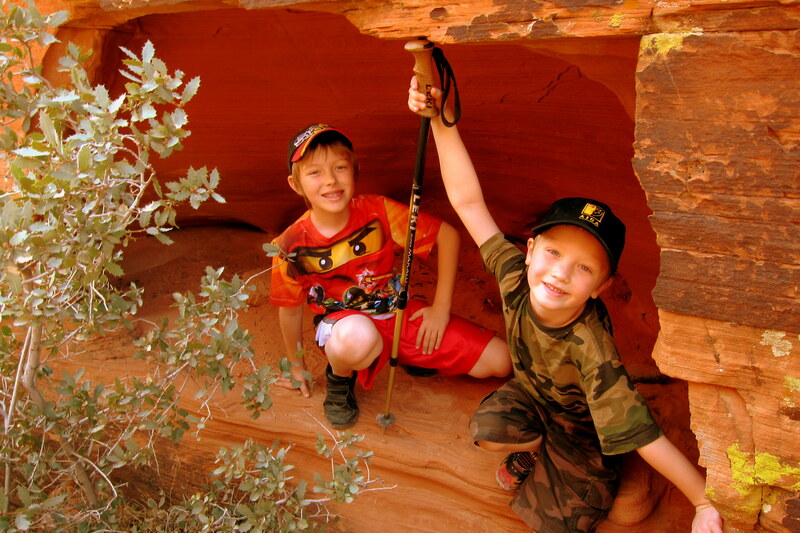 Jack and Tucker amused themselves by scaring the annoying bees away by shouting “Boo Bee’s” at the top of their lungs and listening for the resulting echo off the canyon walls. Go ahead…..say Boo Bee’s out loud and see if it doesn’t bring a smile to your face! Returning to the visitor’s center there was a number of displays about the Sonoran Tortoise in honor of Mojave Max’s recent coming out. 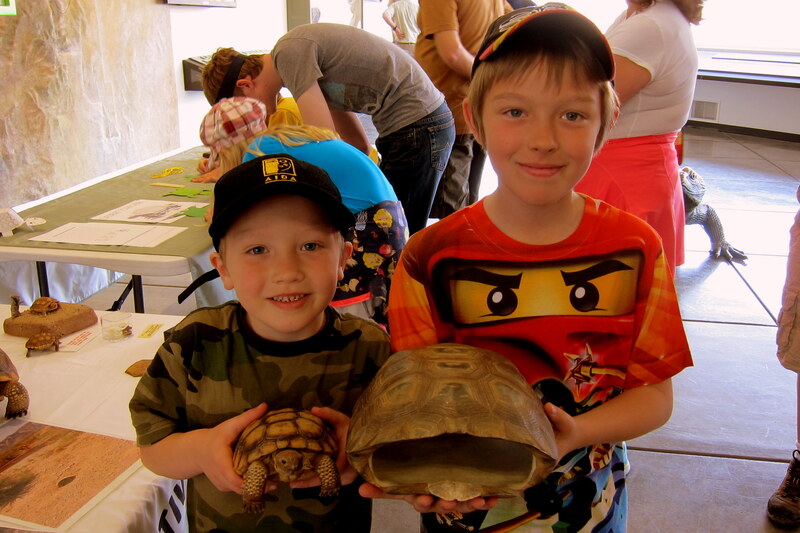 Here the boys were able to examine the shell of a desert tortoise that had become dinner for an animal a bit higher on the food chain. Towards the end of our final week and before Uncle Steve had to return home to Missouri, we all met at the Rio Casino to enjoy a fantastic meal. The Rio Buffet is consistently rated as the best in Vegas and the kid’s scored local discounts for us all! 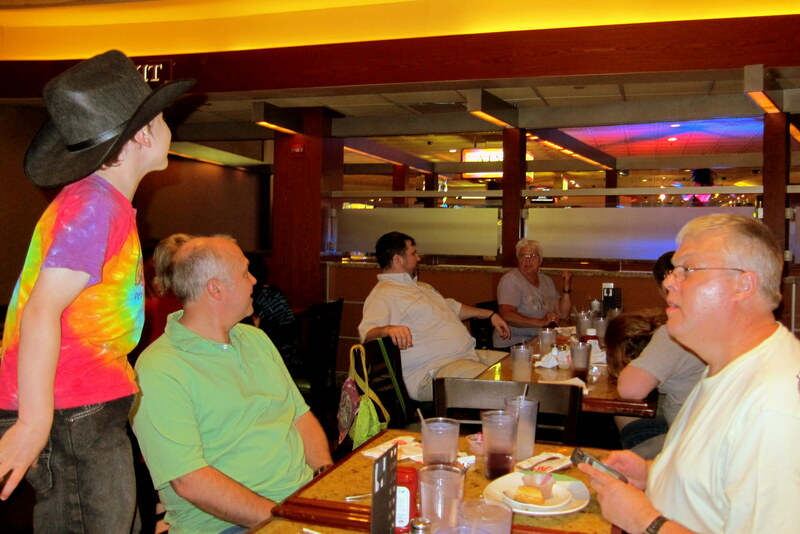 Since the buffet is within the casino, the boys were mesmerized by the show girls and cocktail waitress that were prancing about…..Jack and Tucker were interested as well! At one point, mid-meal, a dancer started her performance in a nightclub adjacent to the restaurant. Jack and Tucker took great interest in this cultural opportunity and stood on their seats for a better view. I think Uncle Steve was a bit perplexed! Their action and reaction pretty much brought the house down as everyone around was enjoying watching Jack and Tucker watching the dancing girl! In addition to the Rio Buffett, we enjoyed the culinary offerings of the following establishments during our stay: In and Out Burger, Memphis Barbeque, Captain D’s Seafood, Rubio’s Baja Grill, Baskin Robbins, Harvest Bread, Rio Cafe, California Pizza Kitchen, Pei Wei, McDonalds, Rosati’s Pizza, BJ’s Brewpub, and an incredible home cooked Easter meal at the Owens home. 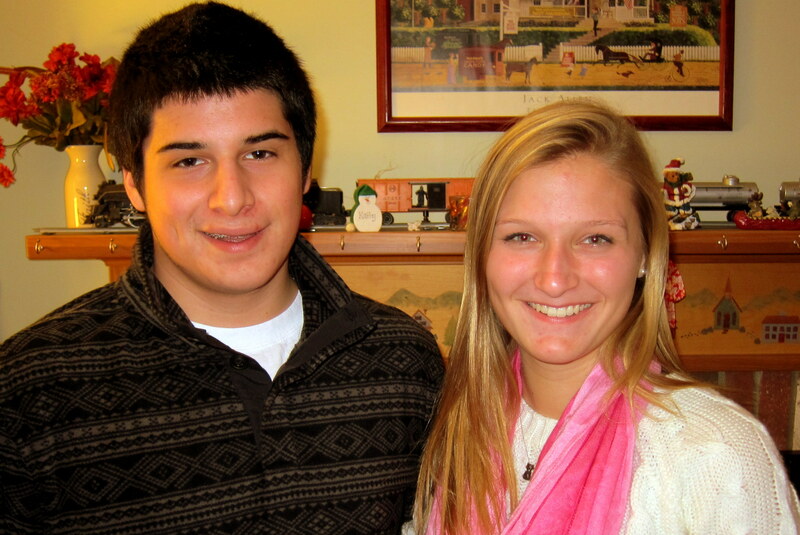 While Uncle Steve was in town Kit and I were given new nicknames…..Kitty Kat and Billy Goat. And so, Uncle Steve became known as Stevie Bob Hillbilly. Hey, Steve….all’s fair in love and naming rights! Actually Steve is a great guy and the boy’s love him dearly…..they anxiously await his visits every year! We have encouraged Uncle Steve to visit us in Maine and we truly hope he takes us up on the offer! During our stay in Vegas, the weather was incredible! Temperatures in the 70’s and 80’s, bright blue skies and gentle desert breezes with very low humidity. 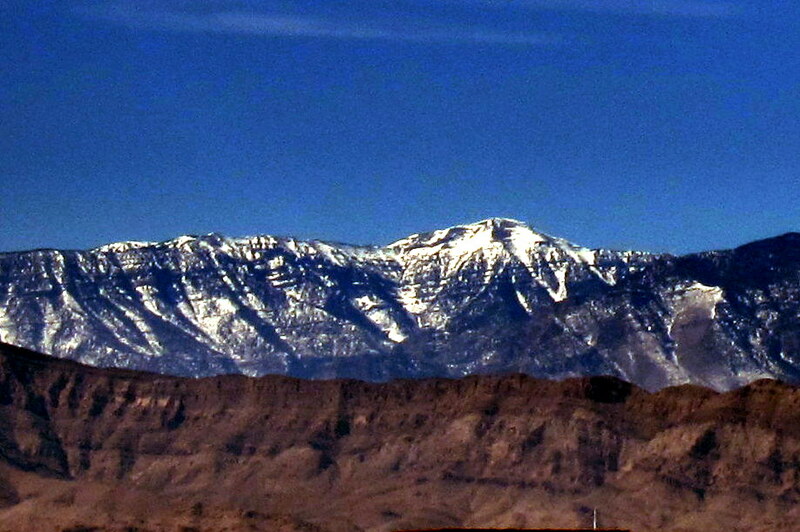 However the mountains to the west showed signs of snow and the nearby ski area was still in operation on Mount Charleston. The final weekend in town the boy’s once again stayed with us. That Friday, I heard through the grapevine that The Thunderbirds were going to be flying a practice routine…..so off to the hanger we went where we were escorted to the bleachers next to the flight line. 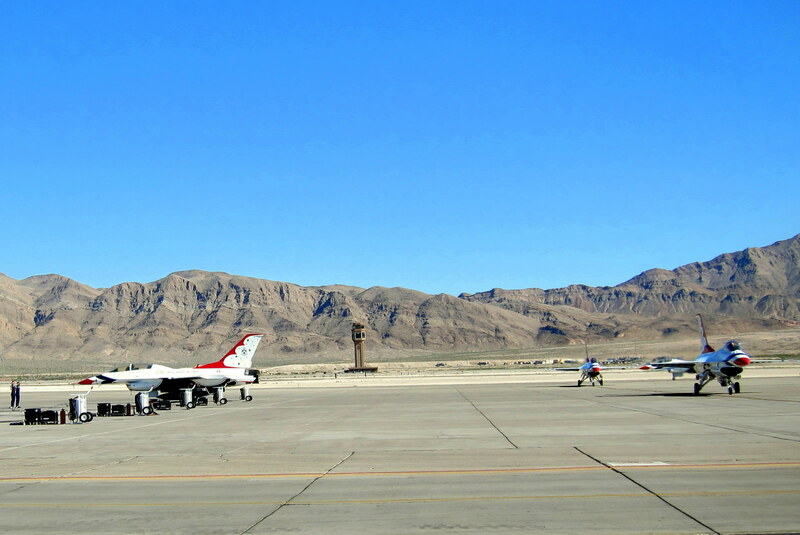 After watching the practice session, many of the same maneuvers profiled in the last journal, the boys were able to watch all six Thunderbirds land and taxi to their designated position on the apron. After the engines were shut down and the pilots were de-briefed they walked over to visit with Jack and Tucker and answer some of their questions. An enjoyable and fantastic opportunity for us all…..Thanks guys! Since we were about to weigh anchor and get underway once again, I did my pre underway checklist. While checking the tire pressure and wheel lug nut torque I noticed a Phillips head screw imbedded in the aft starboard tire. 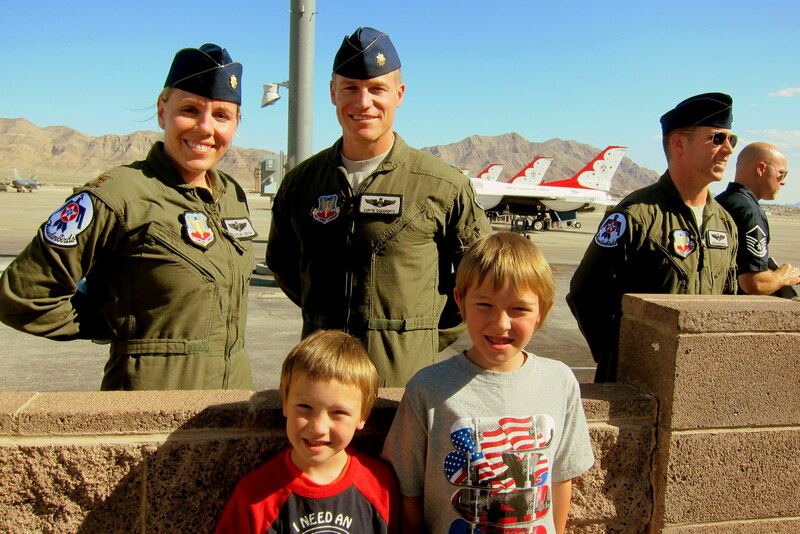 (Hey…..I had to squeeze some navy lingo in somewhere as I’ve been surrounded by the Air Force all month!) No telling how long the screw had been there but the tire had not lost any air. Thinking it might be a very short Phillips head screw; I attempted to extract it and was immediately greeted by the sound of escaping air. Taking the screwed tire to the local Firestone dealer resulted in a repair and, as a former customer, I wasn’t even charged for the service! 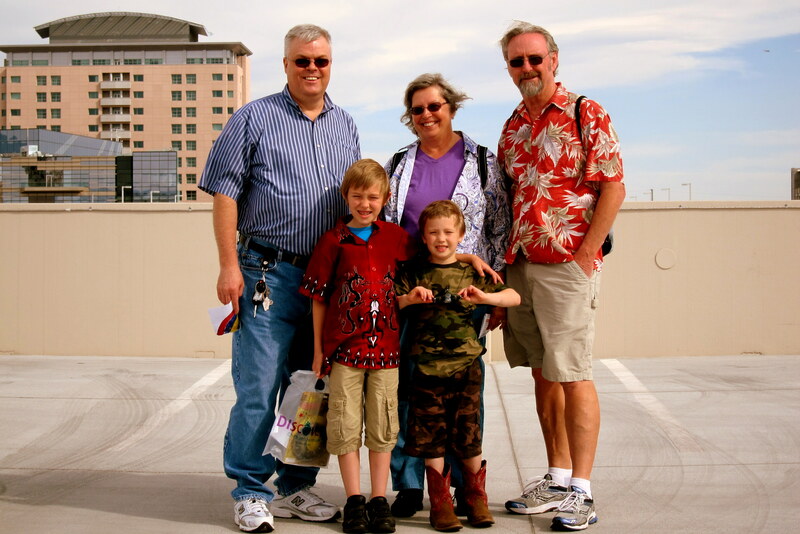 Well, Kit and I had a great time in Las Vegas and we hope the grandkids did as well. It’s always tough to leave however we must be moving on. Just one last shot of the four of us taken by Uncle Steve in front of the water-wall at the Bellagio. Till next time guy’s…..we love you! 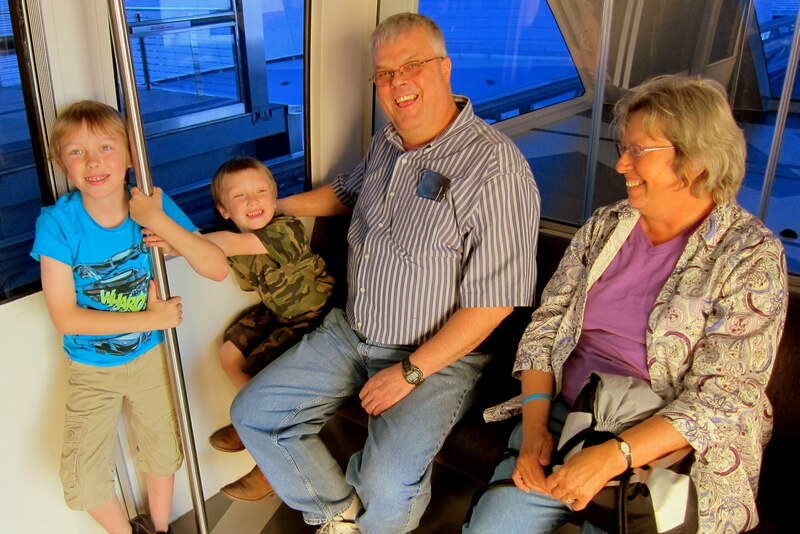 Kit’s Corner: We had such a wonderful time in Las Vegas with our grandkids. They are growing up so fast; it’s hard to believe the changes we see in a year’s time, or, as with Jack this time, six months. They keep things hoppin for us, never a dull moment when they around and no rest for either of us. Since we “tag team” it, we take short breaks now and then just to catch our breath! An added bonus this time through was having Steve with us on a few of our outings. With his booming voice, the kids have a lot of respect for him and he is so good keeping them reigned in, especially while on the Strip to see the Bellagio Fountains, Kevin’s show, Zarkana, etc. Thanks Steve! This entry was posted in 2013 Excellent Adventure, Uncategorized. Bookmark the permalink. Oh man! great commentary….you never fail to entertain us, Bill, and Kit, you must have a great amount of patience and fortitude! Know you are enjoying the trip! We are thinking of making the run from Bend, Oregon to Maine and maybe we will catch sight of your Arctic Fox along the way! Thanks for the nice comment. When you make it to Maine, please contact us…..it would be great to finally meet in person! Thanks for the comment and wishes. Looking forward to seeing you folks out at the lake this summer as well. YOUR NEW FAN INVENTION OVER THE BED HAS CAPTURED JEANNE’S INTEREST. I’M NOW ON MY WAY TO A LOCAL ELECTRICAL STORE TO PROCURE TWO UNITS. SORRY YOUR TIRE GOT SCREWED, I HAD A SIMILAR EXPERIENCE IN NEW BRUNSWICK, CA. A MASTER LINK FROM YOUR BYCICLE CHAIN CAME OFF AND I FOUND IT IN THE TREAD OF MY NEW AFT PORT GOODYEAR. DON’T HURRY HOME, STILL COLD AND SOME AREAS HAD SNOW LAST NIGHT. SOUNDS LIKE YOU HAD A GREAT TIME WITH THE FAMILY. THE ONLY PART MISSING WAS A VISIT WITH YOU DEAR MOM. You’re welcome Chetti Andretti! 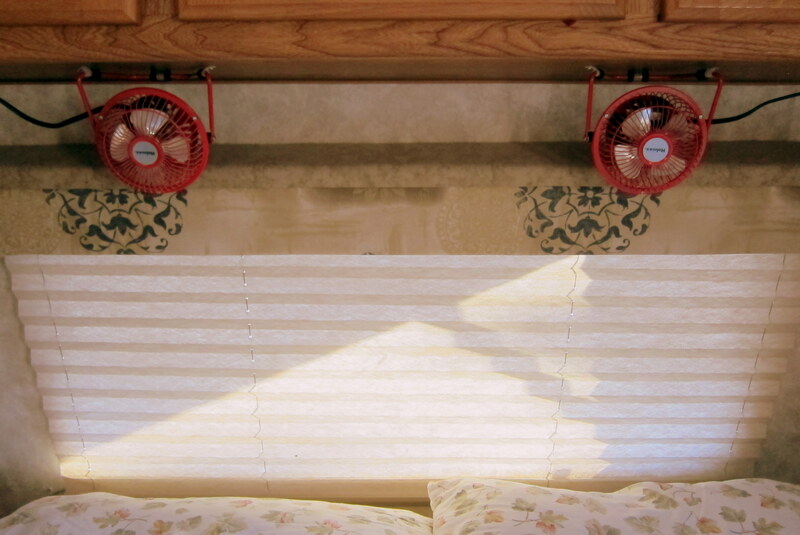 We picked up our two fan’s at The House of Reny…..so far, so good! Slowly heading home by way of the east coast, should arrive in about a month. Hope to see you guys sometime this summer! I’ve just enjoyed a wonderful journey wiith you while sitting here at my computer. What a great month you had! 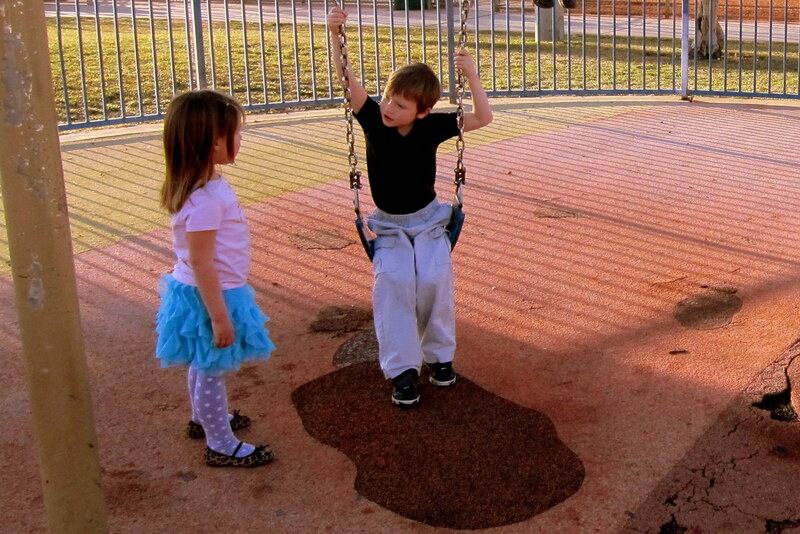 And it was so good to hear what’s going on in the lives of Little Joe, Katie, and Chris (as well as their parents). Although we knew some of Joe’s escapades from his own FB page and of Katie being persued for her LAX prowess, I don’t remember hearing about Chris’ foul-shooting…Congrats, Chris! As always, good to hear and see your adventures. See you soon when we are all back in Maine. Love ya! Hey guys, thanks for the comment. We are slowly making our way back via the southern and eastern route this year…..should be home in another month or so. Stay well, and stay safe on your own journey north…..see you soon! 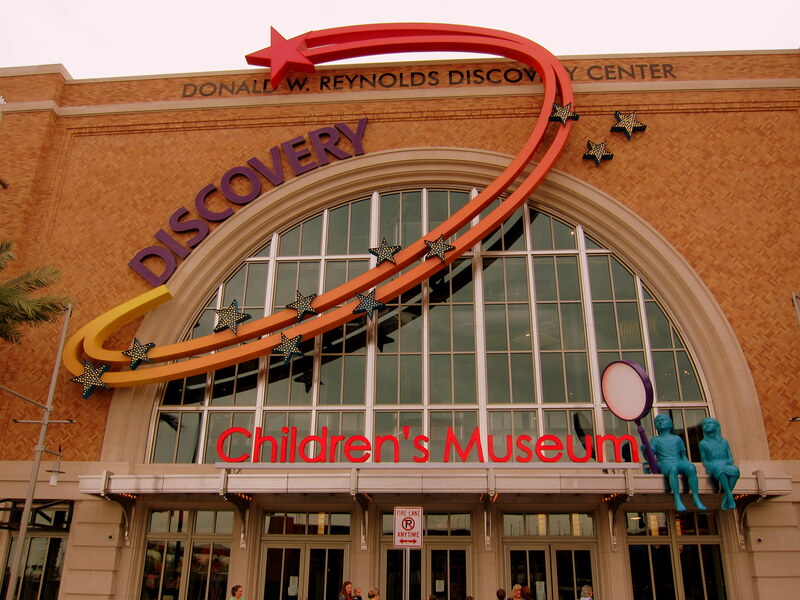 The interactive Discovery Museum is very similar to the one in Honolulu. We took Kylee there the year that Terry & Lee were visiting Thailand. Kylee had a ball! It’s nice that there are museums built to appeal to children. I remember as a youngster being dragged to the Natural History Museum in San Diego’s Balboa Park…..I really didn’t appreciate it at that young age. Ironically, it is still in operation and has changed with the times…..much more kid friendly today. 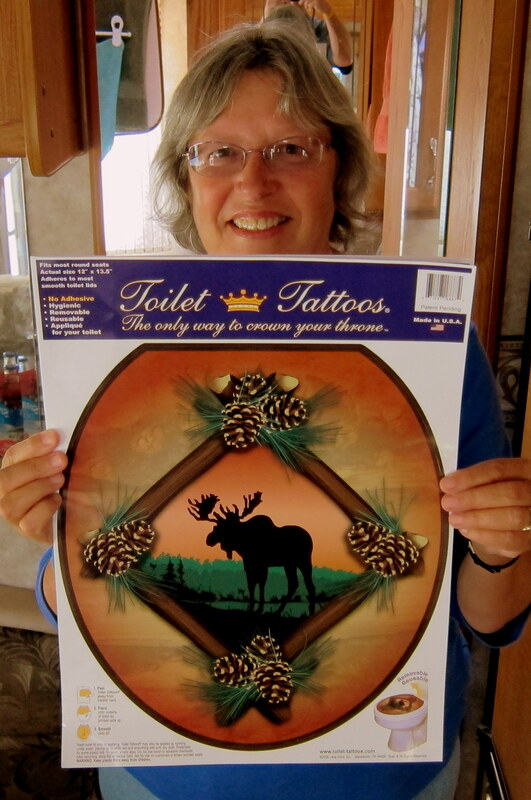 Yep, your mom was at The Wal*Mart and those Toilet Tattoos were on sale…..she had to fight among the other rednecks for a handful of the more picturesque offerings. We left a zebra themed “Pot Tat” on one of Suzie and Kevin’s thrones and we have plenty left to decorate the family home and camp libraries! Heading home by way of the southeastern route this year…..hope to be on your doorstep in about a another month or so! Can’t wait to see you guys…..Love you! I really enjoy your blog! I especially love it anytime you talk about the boys or post pictures of them. I love the new nickname… it is ironic because my email address is hillbillyboy! I so enjoyed spending time with you and Kathy, hopefully we can do it again next year! Be safe on your journey back home. Hi Steve, thanks for the nice comment! We had a blast hanging out with you and the boys in Vegas and please remember you have an open invitation to visit us in Maine at anytime! Take care, and please stay in touch. Hi there kathy and Bill I just wanted to share some good info with you and you may spread the word as well: Free Annual Federal park pass must have a military ID or an active CAC card to recieve it go to(www.nps.gov/findapark/passes.htm) to locate a federal park to obtain free annual pass no gimmicks just free and save money too. Have fun…. Hey bud….good to hear form you, and thanks for the tip on National Park access. I’ll certainly pass it along to others. We are slowly meandering our way home, currently in Arkansas on the Mississippi River across from Memphis. Pulling out today as the river is rising pretty rapidly and predicated to be at flood stage by mid week. Take care, say hi to all then folks that may remember us!